Carrot soup. It isn’t exactly a cause for celebration, is it? Carrot soup even sounds dull. Not this time, though. I love a dish that takes a reliable, though perhaps uninspiring ingredient, and transforms it into something special. 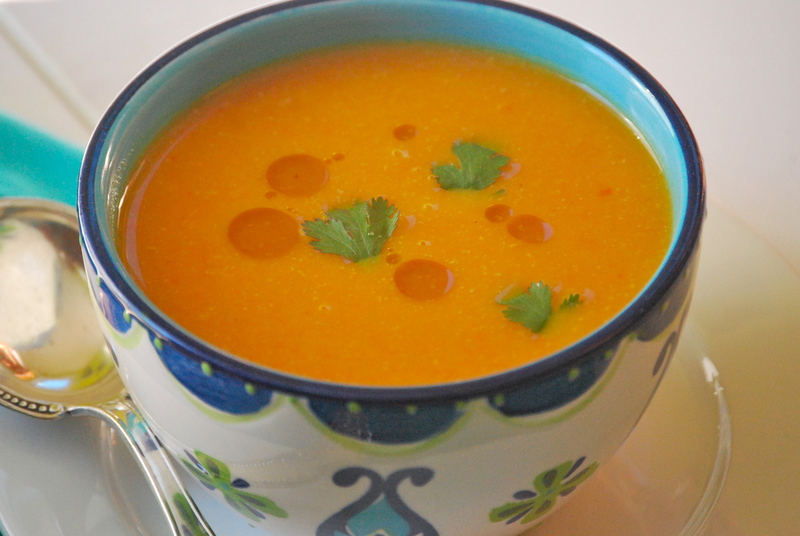 Here the addition of a few interesting Asian flavors make this carrot soup absolutely delicious. And as a bonus, this is a perfect weeknight soup. Chances are the you already have most of these ingredients in your kitchen, and it comes together in less than a half hour. Like most soups, this recipe has a lot of wiggle room so you can adjust it to fit your palate. If you like things spicy (like we do) add more red pepper flakes. Or you may want more peanut butter or sesame oil. Feel free to experiment. As always, make sure you taste before you serve it. Since they remain the central flavor of this soup, it’s worth tracking down organic carrots. You’ll find the flavor is simply better. I paired it with this salad (without carrots), and it made a perfect, light weeknight meal. Hope you enjoy it! Heat the olive oil over medium heat in a Dutch oven. Add the onion, celery, and garlic and cook a few minutes until the vegetables begin to soften. Add the chopped carrots, ginger, red pepper flakes and broth and simmer until the carrots are soft, about 20-25 minutes. Stir in the peanut butter, soy sauce, honey, and sesame oil. Puree with a emersion blender, or transfer it to a regular blender and mix until smooth. Taste. Adjust seasonings if necessary. Add a splash of rice wine vinegar or lime juice. 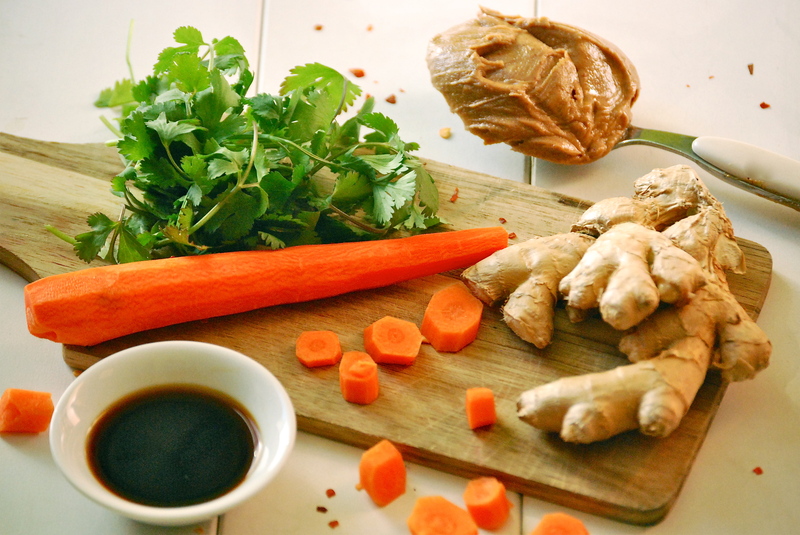 You may want to add more peanut butter or soy sauce, depending upon your personal taste. Enjoy! Thanks so much for stopping by Relishing It — I love hearing from you. this looks delicious! 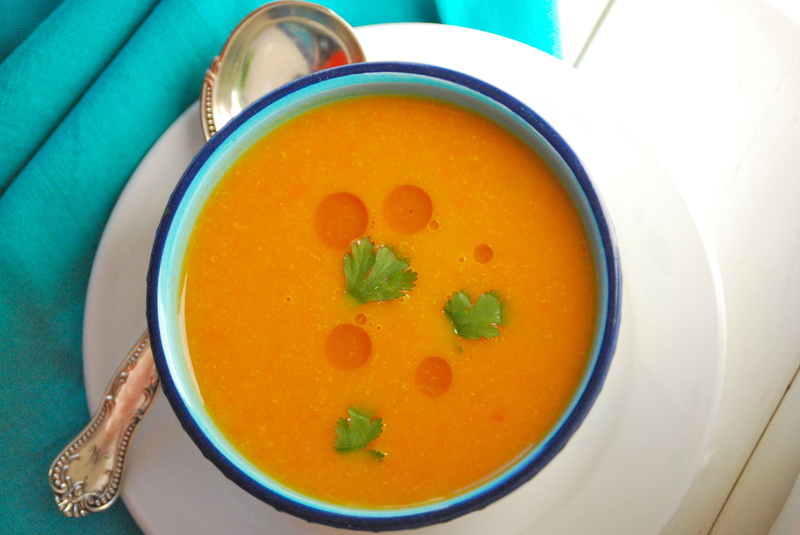 I have so many carrots stored up from fall; what a nice, simple soup recipe with a twist! Can’t wait to try it this week! Thanks, Liz! I think you’ll really like it — plus, it comes together so quickly. Big bonus! I am SO making this! I’ll just have to sub sunflower seed butter for the peanut butter and use gluten-free soy sauce. Yay! HOLY MOLY! I just made this and is it ever delicious. I think I could eat it every day. Thank you!